It is a fact that shopping and booking travel frustrate the life out of most travellers. All research points to the need for more personalized services. It’s all very well to sort and filter thousands of options, but facilities, amenities and location are not exactly personal and wading through all the options is tedious and slow. Travel is personal: The tourism industry must personalize travel shopping so that we travelers do not have to wade through piles of unrelated data to find a hotel that suites our personality. 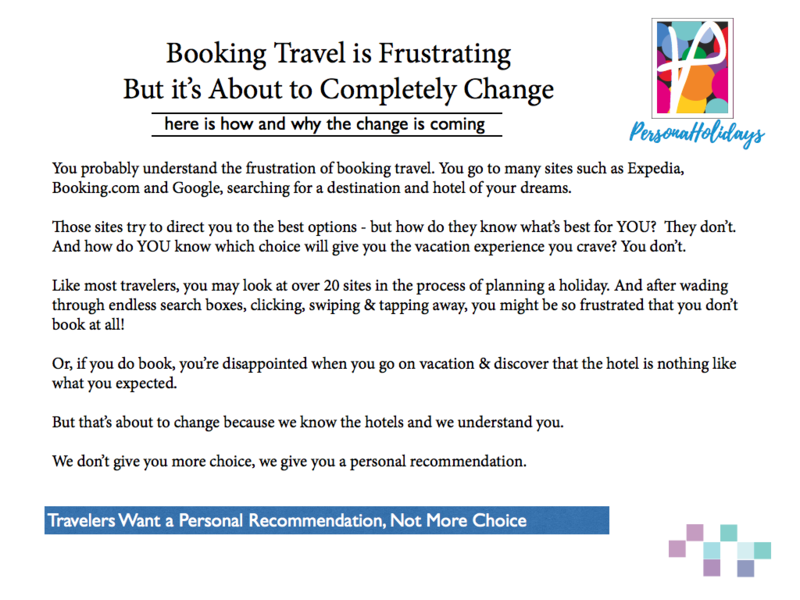 Travelers want a personal recommendation not more choice. Today we have many more tools and application to help create intelligent system than ever before. Today’s programing languages and apps make is possible to implement complex behavior analysis, profiling and artificial intelligence for smart solutions. As a result it is much easier to use these apps on new systems rather than re-engineering existing archive software. That gives us a head start in competing with the giants. The established players built legacy system that are not flexible. They can not easily work with the modern platforms that are flexible, adaptive, mobile and lightening fast. Our journey starts with Realholidays.com a dynamic packaging system way ahead of its time when it launched in 1999. Realholidays was our first expert system. It interpreted browsers behavior and assigned personality traits creating their profile. Some personality traits are fairly obvious: If you choose a safari adventure, for example, you are probably the adventurous type. Some are more nuanced and require validation across multiple choices. The systems we developed included a vast database of choices and trigger words gathered and validated with every visitor. After hundreds of thousands of visitors used Realholidays we had a pretty good idea of how to assign words that described travel personalities. These words we called matchwords. In our expert system these matchwords are also assigned to hotels. They describe the ambiance, the decor, the people one would like to connect to, who they admire, how they like to be perceived, what interests them and the various moods and attitude that they might demonstrate. We got very good at classifying hotels and predicting personality from the behavior of our many website visitors. In the following pages we will share guest stories that show how well the system worked. We will also show how we have expanded the concept, made is exceeding fast and accurate and very visual and intuitive. Our new systems are vastly different in detail from RealHolidays. We are no longer stuck with HTML and Java. Today we have a wealth of programmatic options, mobile apps, and applications that are fine tuned to the modern interactive and intuitive environment. We started with a fresh pallet and created a modern system that breaks all the rules of conventional programing. Yet it delivers intuitive personal results at the speed of thought. Destinations, tourism association, chain hotels, groups of hotels and distributors. Any organization representing or marketing a diverse set of tourism properties.